Do you buy clothes? I'm assuming you do. It would be very unlikely that you would be reading this on your computer/laptop/tablet/phone/any other smarty boots computery type thing if you came from a society where clothes were optional. So we've established that you do indeed buy clothes. Here's one for the gentlemen ­ what the hell are shirt manufacturers playing at? Sorry pardon excuse me? My gripe this week is shirt manufacturers. Why? Well, it's nothing to do with the product per se (Don't call me Percy.). It is to do with the packaging. If you buy nearly any item of clothing, it is either hanging on a rack or is wrapped in such a way that it can be opened easily should you wish to try it on. Correct? Even shirts of the casual variety are on hangers. However, somewhere there is a line which differentiates casual from formal. From hanging unwrapped on hangers (casual) they change into something that suddenly has to be wrapped in cellophane with various bits of card and plastic to ensure that the collar remains stiff as well as clips and pins to bind the whole thing into a rectangular package that cannot be opened (formal). Why? Why do manufacturers deem it necessary to truss shirts up in this way? I can't think of any other item of attire that is packed in a similar manner. Obviously, something has sparked my ire. It has indeed. I have just bought a formal shirt that came in a box. Once I opened the box, I discovered it was also wrapped in a sealed plastic bag. Having removed it from its box and the plastic bag, I then note that the shirt has a thin material band bearing the manufacturer’s name around it. What is that for? The maker’s name is on the fn box! You don’t need telling again! Next we come to actually removing any card/plastic and clips/pins from the folded up garment. First I removed the stiffeners from around the collar. How many? Four. A piece of card inside the collar, a piece of card underneath the collar and a piece of plastic around the button. Granted, they all served a purpose, but the fourth one had me beaten. I just couldn't work out is purpose. It was a small piece of card in much the same position as the plastic. So why was it there? Answers on a postcard please. Next I came to the problem of removing any clips and pins. First of all, the plastic clips. There were five of them. Two held the back of the shirt in position, two held it at the shoulders to yet more card, and one held a cuff in a rather camp position at the front of the shirt. Next pins. Seven. Seven pins, for goodness sake. These were dotted all over the place. I reckon they were strategically placed so that I might not know they were there and end up stabbing myself when I put the thing on. I suppose if your job is wrapping up shirts in this way, it would get pretty boring so why not brighten it up a bit by hiding a few pins so that the buyer of the garment might cause himself an injury? Such thoughts might make the tedium of the job somehow worthwhile. Any road up, by the time I have unwrapped this item of clothing I am a little bit annoyed. Why? Well, it takes ages to unwrap a shirt packed on this way. That isn't why I'm annoyed though. No, I am annoyed because I am thinking how long it must have taken the wrapper (that is my name for the person who wraps the shirt, not the material around the garment. Nor, incidentally, a person who talks along to music when he should be singing.) ages to do the wrapping. Why bother in the first place? It simply isn't necessary. But I am also thinking cash here. What proportion of the cost of the shirt is due solely to having it bound up in this manner? I imagine that folding the thing up so perfectly and inserting all the pins/plastic/card takes longer than unwrapping it. Agree? Granted, the person doing the job is probably so adept at doing it that it only takes a few minutes. But then, actually making the garment is also pretty quick. And as the garment is probably made by some 8 year old whose pay equates to a few pennies a month, the cost is probably next to nothing. So come on Mr Real brook, instead of having some poor sod spend ages putting pins and stiffeners into your shirts and another poor sod having to spend ages removing them, just don't bother with wrapping them up in the first place. That way you might be able to bring the price down to a level which isn't so exorbitant! Or, heaven forbid, pay your workers a bit more than a bowl of rice a day. We’ve not had a gramblerised toon for a while; anyone in amongst that lot with a song that might fit the bill? Ah... the old number one from Clive Dunn: Grandad. I was always surprised it reached number one; I’d have said it was more a number two. 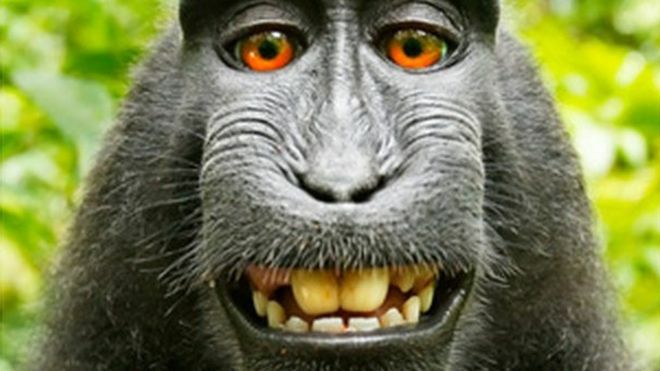 A Monmouthshire wildlife photographer involved in a copyright row over a monkey selfie was "relieved" after a court ruled in his favour. But a court in San Francisco disagreed, ruling copyright protection cannot be applied to animals. Snapper David Slater, of Mathern, said he believed he was "the first person in history to be sued by an animal". The case was brought by the campaign group People for the Ethical Treatment of Animals (PETA) which claimed Naruto, a crested macaque from Indonesia, should be the author and owner. Yet Mr Slater, 50, said the monkey in his photograph was a female called Ella. The monkey took the photograph after Mr Slater set up the camera and purposefully left it alone so it would approach and play with it. He described the case as a "long saga" which he was "relieved to get out of the way". "They [PETA] are more about money and publicity than animals. They have wasted people's donations on pursuing this case," he said. "At least it's got people thinking about the monkey, its situation, animal rights and how intelligent these animals are." A spokeswoman from PETA said despite the "setback", the case was "a vital step toward fundamental rights for non-human animals for their own sake". Proof, if proof were needed, that the world has officially gone mad. Anthony Martial had headed United in front, before Gylfi Sigurdsson's glancing effort set nerves on edge at Old Trafford. Wayne Rooney flicked home a Martial cross with 13 minutes to go for the winner in a close contest. Adam Armstrong claimed a first-half hat-trick and fellow Premier League loan striker Jacob Murphy scored twice as Coventry City demolished Crewe. Despite boss Tony Mowbray's one-game touchline ban, City were 4-0 up by the break, set on their way when Armstrong cashed in on a Ben Nugent mistake. Murphy then fired left-footed into the corner before Armstrong's penalty when Marcus Haber fouled Romain Vincelot. Armstrong completed his treble on 45 minutes before Murphy rounded it off. Matt Clarke opened the scoring with a near-post header from Ben Davies' corner. Marc McNulty doubled Pompey's advantage when he powerfully rifled in Enda Stevens' low cross. Shame about that; The Grambler very nearly got 2016 off to the perfect start. No matter; what about this week, Saturday the 9th of January? Houston, we have a problem. It is cup weekend in both Scotland and England. And? And it means that there are only eleven league matches taking place at 3pm on the day. Well, rules are rules. If there are league games on, then The Grambler must make his/her/its prediction from those. So what has he/she/it randomly selected? 1243? What happened that year? Apparently, the 89th Emperor of Japan was born. Go-Fukakusa was his name. Hmm... wonder what a ‘kusa’ is? Teaser time. Yay! Last week I asked which club drew the most Premiershit matches (15 from 38 played) in the calendar year January to December 2015. The answer was West ham. What about one for this week? Let’s have one about the rules of play, shall we? A couple of questions for this week’s teaser. If play is at a standstill when a substitute is brought on, what two things is he not allowed to do? What is the reason for this rule? Hmm... very interesting. Any road up, since that time, I have learned more about old Gracie and can understand why she was so highly thought of when she was younger. This week’s link is called 'I never cried so much in all my life'. It’s a bit creaky, but quite risque for prewar Britain. I hope you like it.